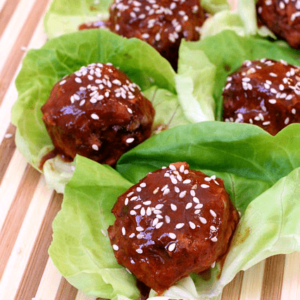 These Crock Pot Asian Meatballs are so delicious! 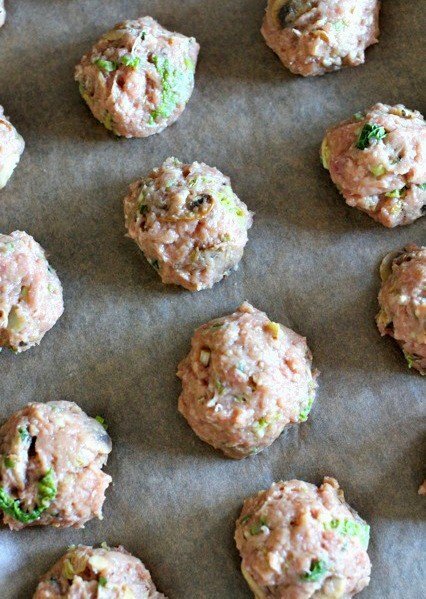 This meatball recipe works for dinner too, add rice or noodles or eat them as is for a low carb meal! There are a couple of steps to making this meatball recipe, but it’s really so easy – and so healthy – you’ll be making these all the time! So, this isn’t one of those crock pot recipes that you can dump everything into the bowl and turn it on. These meatballs do need to be baked in the oven first. So what’s different about these meatballs you ask? For one, there are zero breadcrumbs in these guys…none. So if you’re following a low-carb diet, you’re going to love this recipe. There’s also napa cabbage and mushrooms stuffed inside these meatballs so you don’t even need to add a vegetable side dish, but you certainly can! These Crock Pot Asian Meatballs don’t take long at all to put together, there’s just a few steps involved. Cook the cabbage and the mushrooms down in a skillet, then mix in into your lean ground pork, eggs, scallions, ginger, garlic and seasonings. Next form the mixture into meatballs, I used an #20 scoop to help me get them all about the same size. Now bake the meatballs at 400 degrees for 20 minutes. When the meatballs come out of the oven, get them in your crock pot and pour the sauce all over the top. 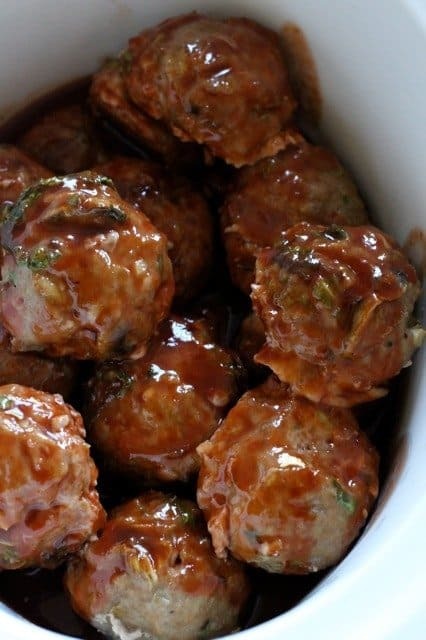 Toss the meatballs gently in the sauce to make sure they’re all coated. Cook on high for 3 hours, or on low up to 6 hours. The meatballs are already cooked at this point but letting them cook in the crock pot blends the flavors together and makes for a super tender meatball in the end. How Do You Serve These Meatballs? 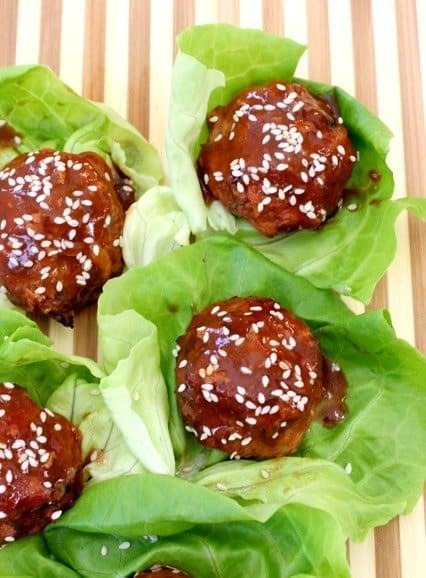 A fun way to serve these Crock Pot Asian Meatballs for dinner is on a butter lettuce leaf for a low carb option. Or you can serve them over rice or noodles! If you’re serving these for appetizers then you can leave them right in your crock pot with toothpicks on the side. The lettuce leaves won’t wilt on you too much so that will work for appetizers too! This meatball recipe is not only delicious, but super healthy for you too! These meatballs are loaded with vegetables so dig in! Heat a large skillet over medium heat and add 1 tablespoon of the canola oil. Add in the shredded cabbage and the salt. Stir and cook until wilted, about 5 minutes. Push the cabbage to one side of the skillet and add the sliced mushrooms to the other side. 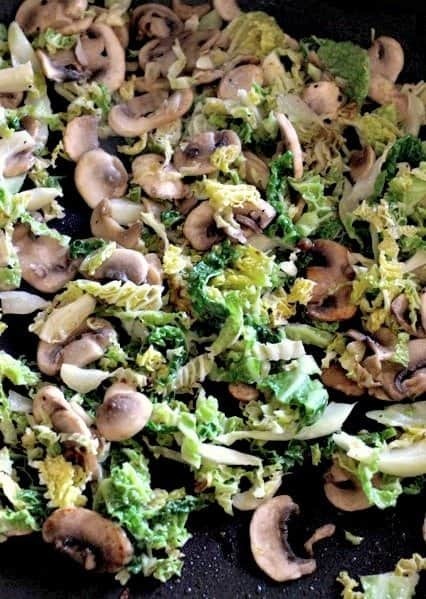 Cook until the mushrooms are slightly browned, then stir together with the cabbage and cook another 2-3 minutes. Remove to a plate and let cool. Put the ground pork in a large bowl then add the eggs, egg white, scallions, ginger, soy sauce, sesame oil, black pepper, and sugar and mix together. Add in the mushroom and cabbage mixture that has cooled slightly and mix in with the pork. Form the meatballs using a #20 large scoop, or make them into the size of a large golfball. Place the meatballs on a parchment lined baking sheet and bake in the oven for 20 minutes. Remove the meatballs from the oven and place in the bottom of your slow cooker. Pour the sauce all over the meatballs, making sure they’re all coated with some sauce. Set on high for 3 hours, or low for up to 6 hours. 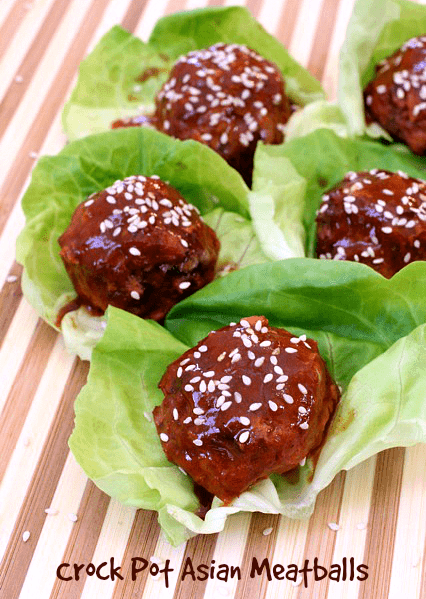 Sprinkle the meatballs with sesame seeds and place into a butter lettuce leaf for serving. 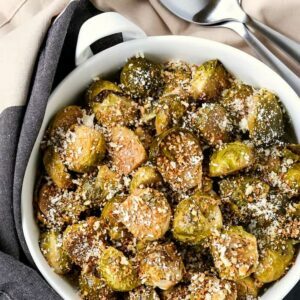 This recipe works best in a small crock pot. If you have a larger crock pot double the sauce so they don’t burn. Also, you could skip the crock pot altogether and just toss the meatballs with the sauce in a skillet for 5 minutes, then serve. Oh these are definitely happening in my house! Love that there is cabbage and mushrooms in there!! These look really good. Why is it that every time I look at your website, my stomach is growling…! I think the girls would like these too! Just made the meatballs….Very tasty! I may try with a sherry ginger sauce because lacking some of the sauce recipe’s ingredients. But to be honest, the meatballs are very good without a sauce. That sounds great! They are good plain, I agree. Thanks for trying them out! 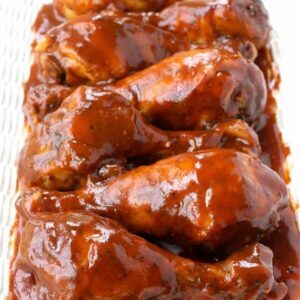 Dan, I tried out another sauce recipe that I got from Yankee Magazine. The recipe was cider-soy-glazed chicken wings. This sauce was very tasty but I didn’t have star anise so I used an store bought asian spice mix. Just thought you might like to check it out. Thanks Millie – so did you use that cider-soy sauce on the meatballs? It looks really good! Dan, I didn’t get to try it on the meatballs because I used it up on chicken. Sorry. However, the cider sauce was very good and I think it would go nicely with the meatballs. The meatball and the cider soy glaze are keepers! That’s great Millie, I’m glad to hear it! I’ll definitely hang on to the cider soy glaze recipe! At what point did you add the cabbage/mushroom mixture into the meat mixture? Gail, you add in the mushrooms and cabbage to the bowl with the pork mixture. I updated the recipe it wasn’t real clear. Thanks for pointing that out! I hope you enjoy them! We love it too, thanks Stephanie! Sounds wonderful! Glad you liked it!